2nd Floor- Queen bedroom, Full bedroom. Located in the historic waterfront district of Temple Heights, Harmony Cottage provides a comfortable location for your vacation. If you are looking for a destination where you can park the car, and not have to get back in it again until the end of your vacation, then Harmony Cottage is the place for you. 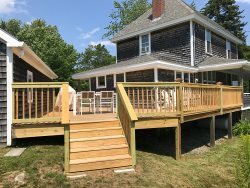 Aside from the beautiful water views of Penobscot Bay, Islesboro and the morning sunrises, a beach just across the narrow cottage road, is the main attraction. A great beach for swimming, exploring, a nightly bonfire, or even a launching spot for your kayak adventure - this semi-private beach is accessible just for you and your neighbors. At the property, there is a great porch for reading, watching the passing boats and ships, birds, and summer folk. A side deck hosts a grill and more chairs for relaxing. Inside, the property is comfortably furnished for renting, just as it has been for the past 10 years. Updated furniture throughout the property will make you feel right at home. Harmony Cottage is located on the Shore Road, which leads for miles along the coast in either direction providing a great resource for bike riding and walking without the concerns for speeding traffic. Perfect! That porch is the best! Lovely, restful, well situated oasis. We really enjoyed our stay in the Harmony Cottage. Loved using the porch with the great views of the bay. The house is very well stocked to make everything easy - especially liked they had everything for cooking. Access to a nice cove is just steps away. Lovely place. Very well equipped. The porch and the view of the Bay is my favorite. There should be steps to back doors. Very hard to manipulate for older people. This is an outstanding vacation rental. I hesitate to write the review because it may make a return very difficult. I have never rented a property that was as completely equipped as this. Everything that one might want or need was available in the house including washer/dryer/wifi/firepit/gas grill. It had spectacular unobstructed views of Penobscot Bay from the east facing windows and from the second floor porch. There was plenty of comfortable seating including rockers, Adirondack chairs, and a table seating for four or more. A right-of-way access to the beach area was available. We watched seals, loons, and various boating activity from the porch. The property was quiet and centrally located for visits to shore resorts including Camden and Acadia. The staff are great to work with. They are willing to help in any way they can. We love Harmony Cottage! It is perfect for our stay which is why we keep returning to the same property. The only suggestion is to take down that young tree that is beginning to block the view from the porch. We have used On the Water in Maine for nearly 10 years and the service has always been excellent. They are committed to making our stay easy, comfortable and enjoyable. Quaint cottage in a quiet community with a great view of the ocean. It was a very pleasant experience working with the agency, On the Water in Maine Inc. The staff was friendly, helpful, informative and knowledgeable. Perfect service! Quiet, peaceful and a fantastic view of Penobscot Bay from the cozy porch. It was great to come back to for relaxing after a full day of touring. They really thought of everything to help give it a home away from home feel; there were fresh cut flowers on the table when we arrived and a kitchen full of everything we would possibly need from kabob skewers & grilling tools to a lobster pot (and instructions), and everything in-between. It was very clean with what looked like brand new furniture and a sweet mix of art and antiques throughout. We loved the safe feel of a private location being off and away from busy streets but close enough to get there when we wanted to. We would recommend Harmony Cottage to anyone wanting to visit Maine! On the Water in Maine was easy to work with and everyone I spoke to was professional and helpful. The view from the front porch was great and we spent a lot of time out there. The cottage is located in a good spot geographically to tour the area attractions. The owners provided anything you could possibly need for your stay. We had a wonderful time and didn't want to leave. The staff go out of their way to ensure the rental process, checking in and checkout was seamless. Everything was wonderful! The cottage has everything we needed to make our stay fantastic! Working with OWIM was easy and an overall pleasant experience. Thank you! Harmony Cottage was immaculate without a speck of dust. It was stocked better than any vacation rental property we have ever rented. Cooking utensils, pots and pans, towels, pillows, etc. were all good quality and like new. The little notes and information left was helpful. It was very comfortable and our favorite feature was the front porch. With comfortable rocking and Adirondack chairs, as well as a table for meals, it was the perfect place to enjoy the beautiful water view. Close proximity to the beach made the stay even more fun. We did everything online but the check-in and check-out which is done by phone. Everything worked like clock work. Emails came out letting you know that payments were coming up and we got the directions exactly when they said they would. You can't beat the porch at Harmony Cottage. We sat out there every day just enjoying the view and the nice breeze. We even got to watch a boat pull up their lobster traps. I've only been in one other vacation rental in my life and I am happy to say that the amenities at the cottage surpassed our expectations. Plenty of utensils, plates, towels, etc. They have a washer and dryer but also a clothes line which was nice. The owners even had a really nice binder put together with things to do. Northport is a great area. You can choose to lounge around and enjoy the weather or take a quick trip to Belfast or Camden to find things to do. I have found your checking-in and out to be very efficient. This was our third stay at Harmony Cottage. It always neat, fresh and suits us as a couple. The Staff at On the Water in Maine are wonderful, making sure that we have everything we need. They answered any questions we had and made the check in/check out process very easy. I would strongly recommend them to anyone looking for a Maine getaway. The cottage was very cozy and the setting was beautiful which is why we booked this particular cottage again. The reservation process was a breeze, and all our questions were answered promptly. We received an email reminder regarding our balance due, so there were no surprise charges to our credit card. As promised, On the Water in Maine, Inc. sent us an email a couple of weeks prior to our stay with specific driving directions and with websites for us to research things to do during our stay. The front porch deck was the best. It was amazing to simply sit in the rocker and watch the water or have a peaceful dinner outside at the table. Make sure you bring your binoculars. Right from the deck, we saw beautiful sailboats, as well as a seal in the water . . . and an eagle flew by the deck two nights in a row! The Harmony Cottage was very, very well stocked. We have rented homes previously via Airbnb and FlipKey and brought many things from home with us (utensils, knives, mugs, etc.) because things were inevitably missing from the homes. However, the Harmony Cottage provided much more than we could have ever needed or wanted. Many thanks to the gracious owners who shared their home with us. The view and the deck - that was the biggest positive. The beach was lovely as well - the landscaping was WONDERFUL and the hanging plants brought in the humming birds - a BIG hit. You are an agency of efficiency and it works, from check-in to check-out. Sometimes a bit one-sided, yet as I have thought about it, you are running your business well. As with last year, the cottage was spotless and all instructions explicit. We will stay with you again. Working with On the Water in Maine Inc. is easy and enjoyable - no hassels. We loved the porches and large kitchen at Harmony cottage. On The Water in Maine kept us informed about everything from how the house was stocked to potential traffic we may hit coming or going. They were very easy to work with and made our renting experience easy to navigate. Beautiful clean cottage with unbeatable views!